Most parents want to help their children do everything they can to reduce the risk of cavities in their children’s teeth. You can’t control how their teeth were made and, unfortunately, some kids are more cavity prone than others. You can, however, control three big factors that contribute to their dental health. Start brushing twice daily as soon as the first tooth erupts using fluoridated toothpaste. Use a rice-size amount for children under age three and increase to pea-size for children over the age of three. Rinsing should be kept to a minimum or eliminated. Start flossing their teeth once the spaces close between the back molars (ages 3-4). Studies show that kids can brush their teeth competently by age 6, yet can’t floss well until 9 or 10 years old. Let your child try first, but always check afterwards. See your dentist every six months for plaque removal and exam. It is important to reduce or eliminate sources of sugar. A cavity can’t form without some source of sugar. 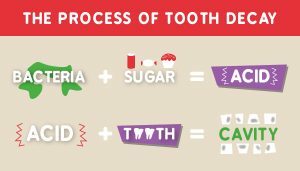 If teeth are going to be exposed to sugar, keep it at mealtimes when the teeth are naturally cleaned. Cut out between meal sugars. Try to eliminate all sugary drinks from their diet. Juice, soda, sports drinks and sweet tea are common offenders. Water is best! 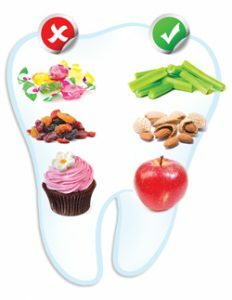 Sticky sweets, gummies, chips and crackers that can be squished into the grooves of the molar teeth should be reduced or eliminated. Healthy snacks such as apples, celery, or nuts are better options. Proper use of fluoride has been proven to dramatically decrease the risk of decay. The most effective source of fluoride is toothpaste so we highly recommend fluoride toothpaste. If you are on well water, you may test your water to determine if supplements are needed. If necessary, Adams and Cheek Dentistry can write a prescription for supplements or a high fluoride toothpaste. For those high risk children, we may recommend a fluoride gel or mouth rinse to use nightly. Appointments during summer breaks and winter breaks fill up quickly since children are out of school during these times. Please contact us at http://raleighncdentistry.com/contact-our-office/as soon as you know your child’s schedule to get a cleaning appointment on the books!